Delhi Subordinate Staff Selection Board (DSSSB) has declared DSSSB PGT result 2015 on 31st May 2015 on official website. DSSSB has declared result of DSSSB Tier 1 Exam 2014 which was held on 30th November 2014 at various centres in all over the capital region. 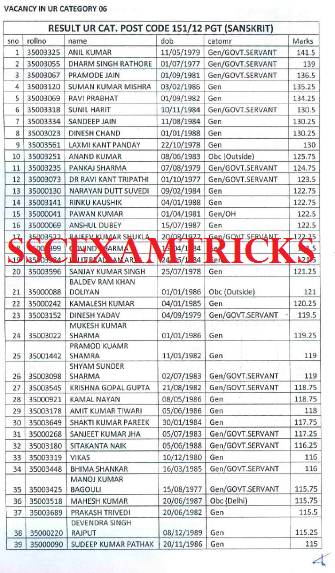 DSSSB has released list of shortlisted candidates who are called for DSSSB Tier 2 Exam 2015. A ten times candidates more than the requirement for PGT has shortlisted for DSSSB Tier 2 Exam 2015. DSSSB has released scorecard of candidates with name, roll number, date of birth and category of candidates. Those candidates who had appeared in DSSSB Tier 1 Exam 2014, they can download DSSSB Tier 1 Exam 2014 Result from the direct link provided below. DSSSB had successfully conducted DSSSB Tier 1 Exam 2014 on 30th November 2014 for the post of Post Graduate Teacher (PGT) Sanskrit Post Code (151/12,152/12,177/14 & 178/14), PGT Commerce Post Codes (128/12,129/12,163/14 & 164/14), PGT Home Science Post Codes (140/12 & 188/14), PGT Math Post Codes (141/12,142/12,181/14 And 182/14), PGT Geography Post Codes (134/12,135/12,179/12 & 180/14), PGT Biology Post Codes (124/12,125/12,159/14 & 160/14), PGT Physics Post Codes (147/12,148/12,183/14 & 184/14), PGT Chemistry Post Codes (126/12,127/12,161/14 & 162/14), PGT Physical Education Post Codes (145/12,146/12,173/14 & 174/14) and PGT Engineering Drawing Post Codes (141/07,46/10,47/10 & 185/14). 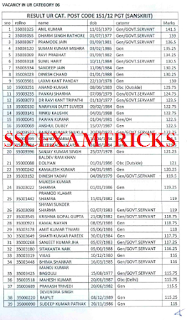 A huge numbers of candidates had appeared in DSSSB Tier 1 Exam 2014.